The cables shown crossed the River Plate (about 23 miles) from Colonia to Punta Lara (Argentina) both are tricore. The purpose of the copper ring is to connect all sheathing wires to a common earth, not shown. The one at the left has “Telcothene” insulated cores. It was originally double sheathed, but the outer sheathing removed, to facilitate handling at the Cable House, no anti teredo tape. 14 sheathing wires, diameter 5 mm. 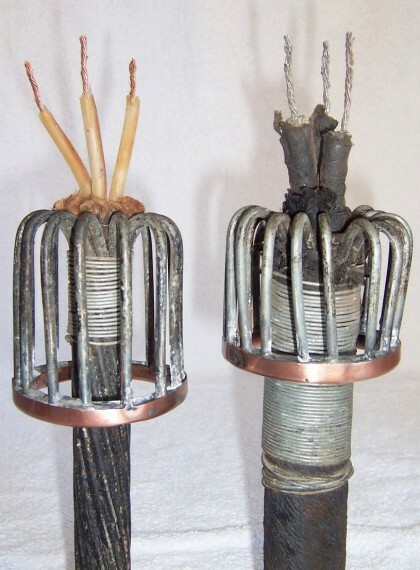 In the one at the right, each core is insulated with India Rubber and lead covered (no anti teredo brass tape), the sheathing consists of 18 wires, each individually taped and of about 5 mm. in diameter, outer service intact.